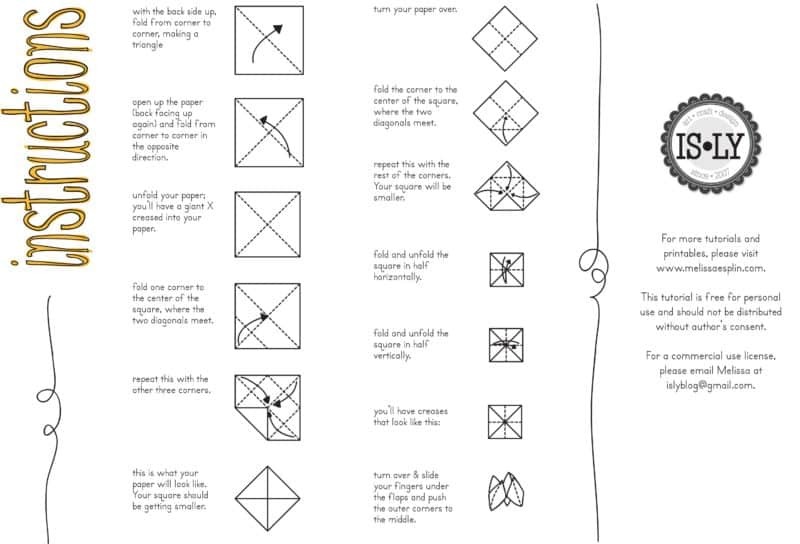 If you have ever wondered how to make a paper fortune teller, you have come to the right place! 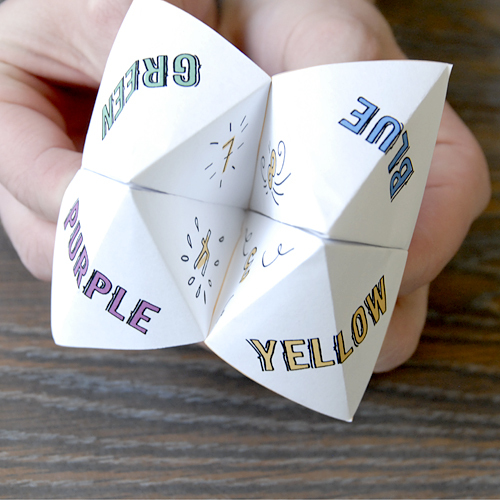 This clever paper fortune teller, a.k.a. cootie catcher, will get the kids doing chores! 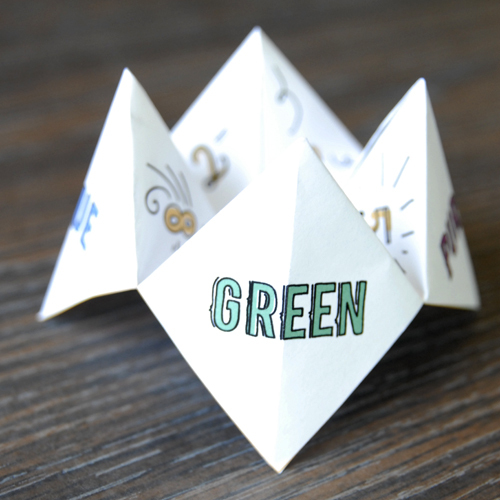 You might also like this wedding theme paper fortune teller with activities to keep kids busy at a wedding or this inspirational fortune teller. As a kid, I always looked forward to summer: no school, no homework. I could do all those things I didn’t have time for during the school year. Inevitably about 2-3 weeks into the summer break, I would get lazy and bored and forget all the things I had planned on doing during the school year. I could never decide what to do, which usually meant my parents would suggest cleaning my room, pulling weeds, scooping the dog poop or something else equally industrious and uninteresting. I’m definitely not saying that my childhood summers were full of just boredom and chores. I am saying, however, that it would’ve been nice if I had had a magical fortune teller to tell me what fun things I should do to avoid the summer doldrums. If you or your children can relate in any way to the story above, I have the perfect solution for you! All you have to do is download, print, cut & fold! These step-by-step instructions will walk you through how to make your origami fortune teller using a single square piece of paper and some diagonal folds. Once you’ve made your handy dandy summer fortune teller, play the fortune telling the game to figure out what activity you should do next. For more tutorials and printables, please visit www.melissaesplin.com. This tutorial is free for personal use and should not be distributed without the author’s consent. For more kids crafts, you should try making this scratch art, slime, play dough and oobleck. Your kids will be amazed with all the kinetic fun! Never be bored again with these fun kids crafts! Such a memorable childhood game! I remember folding this origami pretend to be predicting the future for friends. Thank you for supplying this fantastic activity. This has been a fun thing for me to do with young ESL learners. "Make a sentence with a past tense verb," was one of the ones that we wrote ourselves. Thank you, again. Hi.. you make me very happy with this post.. I print it and play with my girls.. remembering shcool years..
By the way.. I try to post it to facebook ( for my girlfriends) with your Facebook button, but it came up with no picture.. This is too cute! Thanks! I can't wait to share it with my grandchildren! My daughter loooooooooooooooooooves these. I will be doing this with her today!! I really love your blog (sorry that I have yet to comment!). I just linked your post (and blog) regarding the "I'm bored" jar on my latest blog post. And I used your recipe card generator to make invitations for her upcoming cooking birthday party. And...last but not least, my sister-in-law (who introduced me to your blog) is sewing the chef hats and aprons that you posted a while back for the party. So, as you can see, your blog has inspired LOTS of creativity in the very short time period that I've been following. Thank you!! Oh I remember this from when I was a young girl a long time ago. It would be great to make them once again and play a game with the grandchildren. You have certainly sparked my creativity with this post. I love this. I remember making these as a kid all the time- but not nearly so cute! Thank you for the download! I know what my daughter is doing this afternoon!